I read this article and found it very interesting, thought it might be something for you. 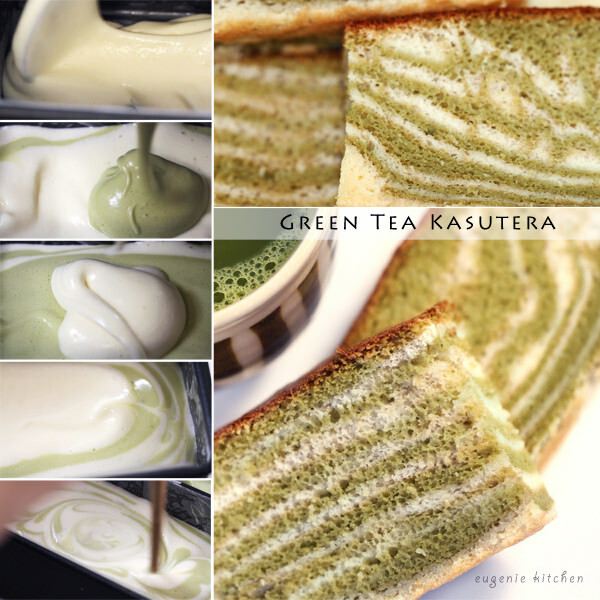 The article is called Green Tea Castella (Kasutera) Marble or Zebra Japanese Sponge Cake Recipe and is located at http://eugeniekitchen.com/green-tea-castella/. Kasutera Zebra Cake Today am gonna make Japanese sponge cake, Kasutera with a little bit of twist. It’s Japanese invention in Nagasaki. But the name came from Portuguese. It means bread of Castilla, which is central region of Spain. This simple sponge cake has complicated history of name. Marble or Zebra Green Tea Kasutera (Castella) The flavour was developed in the refrigerator. And it’s cooled in a wrap, so it stays moist. This is a Japanese sponge cake with rough bread flour, yet very soft and moist. 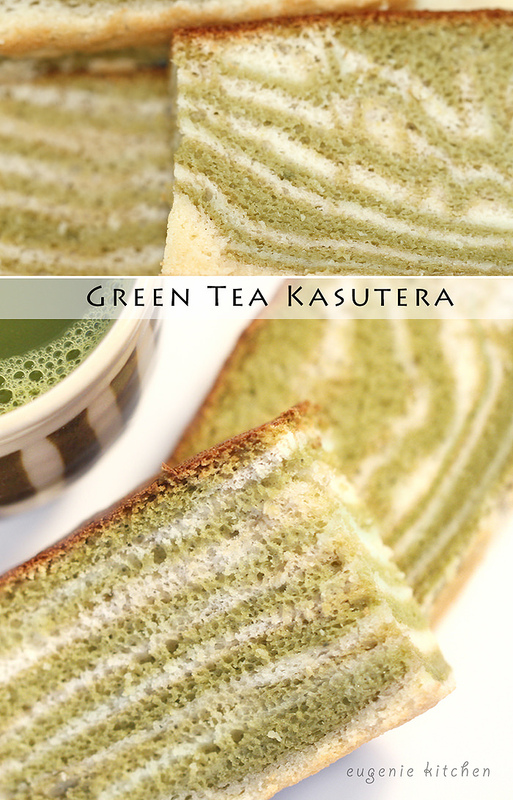 Green tea is perfect for kasutera. 1. Line the pan with parchment paper. Measure and cut the paper. Spray oil into the pan. Today I am using a pump oil spray, you can use butter if you want. And brush to apply oil evenly. And place the paper inside of the pan. Voila. 2. Sift the bread flour and set aside. Bread flour is made of hard protein wheat. 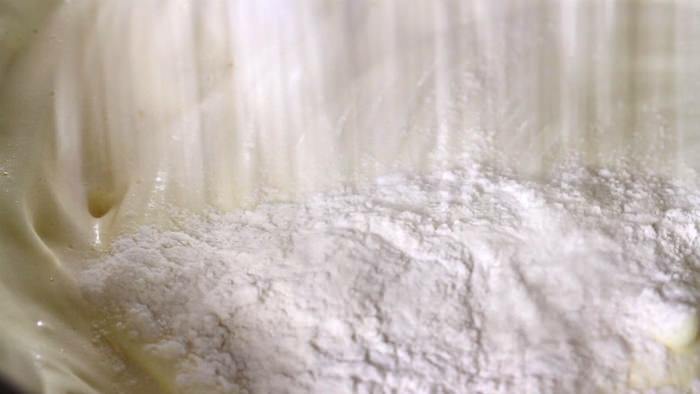 It is coarser than cake flour. 3. Prepare two bowls and separate the eggs. 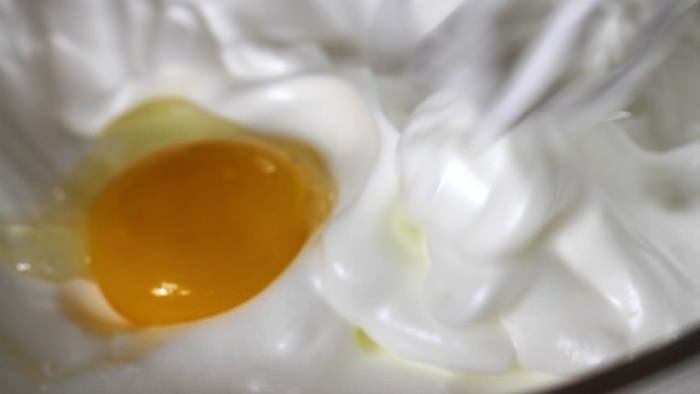 Then on medium speed, beat the egg whites until hard peaks. Then add sugar little by little. Keep beating until soft peaks. This is French meringue. 4. 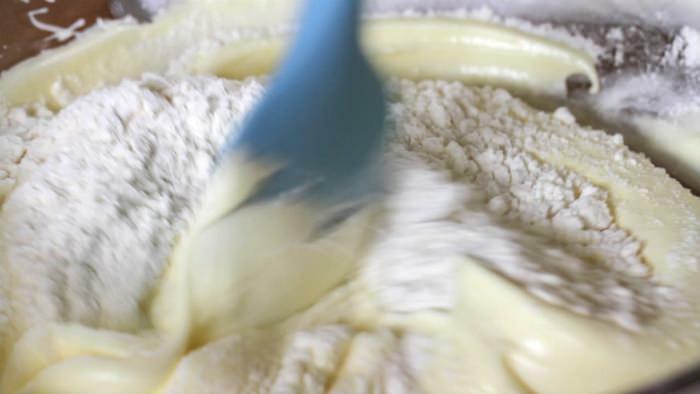 Add egg yolks one at a time into the batter and beat until combined. Then pour in the flour and with a spatula, stir until just moistened. Add one spoon of hot water into honey and mix well. Choose light honey such as Acacia honey, not dark honey. The flavour of dark honey is too strong for castella. Then add in the batter and stir until combined. 5. Pass the batter through a sieve. You will get finer texture through this process. Then, in another bowl, set aside ⅓ of the batter. Add 1 tablespoon of hot water in the green tea and mix well. If you want strong green color, double the portion of green tea. 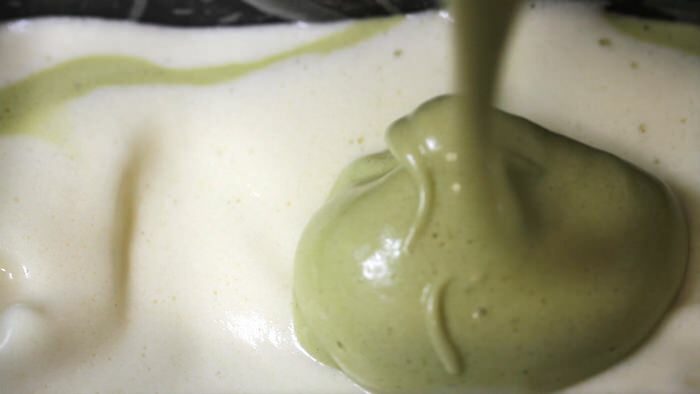 And for more beautiful green color, make sure to use brighter green tea powder for pastry. 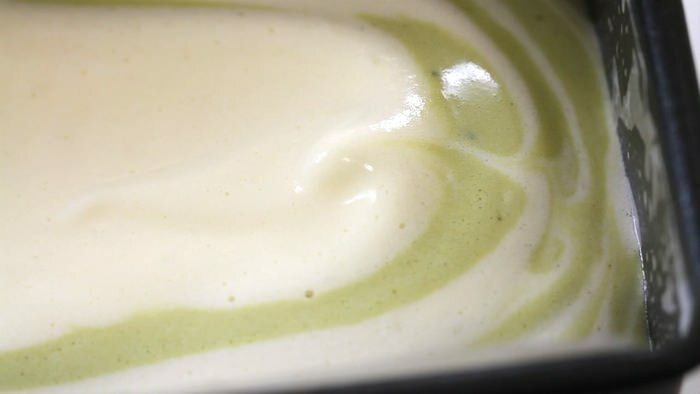 Add the green tea mixture into ⅓ of the batter and stir until homogeneous. 6. In the prepared pan, add in the plain batter and evenly spread on the bottom with the back of a spoon. 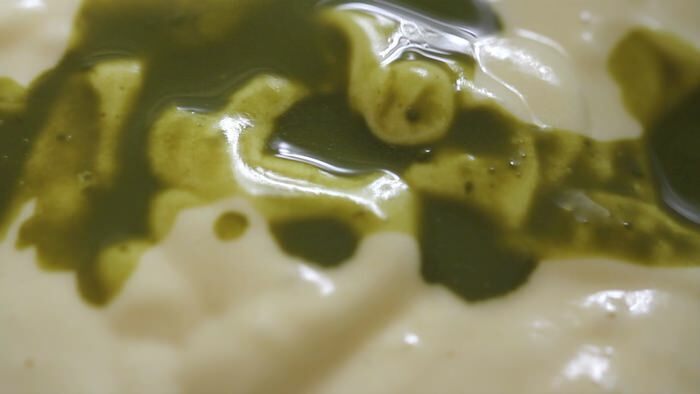 Then add in one tablespoon of green batter and spread. Repeat until you finish the batters. Make sure you fill only ⅔ of the loaf pan. 7. Tap the pan a little and insert in a chopstick and be creative to make beautiful patterns. With this portion, you can make 6 to 10 cupcakes or muffins depending on the size of pans. 8. Bake at 320 degrees F (160C) for about 40 mins. If they are cupcakes, bake for about 20-25 min. 9. Cover with parchment paper when the top is too much browned. If a skewer inserted should come out clean, it’s done. 10. Muffins out first, brush the honey mixture (1 tablespoon honey and 1 tablespoon of hot water) on the top of the cake. After 5 minutes, when they are still warm, cover with plastic wrap and put them in the refrigerator. As for the loaf, brush the honey mixture, too. 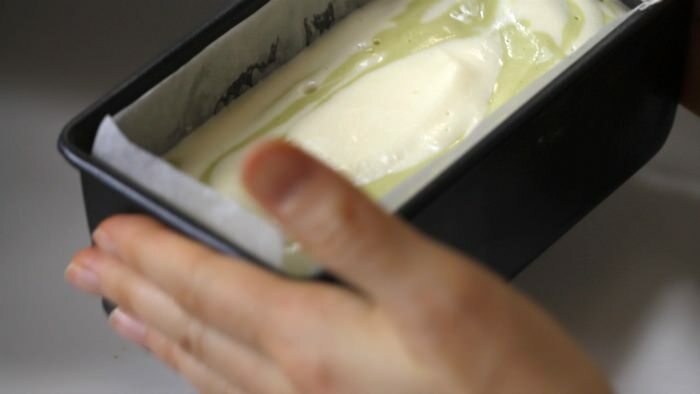 After cooled a little, peel off the parchment paper and cover with plastic wrap and place the cake in the refrigerator. Reserve in the refrigerator for at least 2 hours before serving. 11. With a sharp knife, trim the sides and slice and serve. if i doubled the recipe and baked in larger pan how can i adjust the time?